For those who are interested in the paper arts, keep an art journal or make cards, or do any of the paper crafts, this tutorial on how to make your own custom paper tape from Cathe of Just Something I Made, is a technique that is a little different. 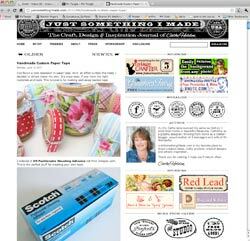 Just Something I Made is full of ideas that are not necessarily a rehash of every other craft blog out there. The freebie section is loaded with printables and the DYI tutorials. So while there make a cuppa and take a browse. Thanks so much for featuring my tape and website! Just spent over an hour there just browsing…great site. Thank you for sharing this with us.